So this time in a fortnight we'll (hopefully) be in our new house, and this time round we'll have a garden! I can't express how happy this makes me! Being off for six weeks over the summer and not having outside space is pretty soul destroying, even if it is just space to read a book in the sunshine. Our new place has a pretty decent sized garden, perfect for lounging around and entertaining ourselves and others over the warmer months. Cue plenty of barbeques and evenings spent outside... if the weather picks up. I am definitely a sun worshipper lover! First on my 'not immediate but really want' list is a hammock, 'cos who doesn't love a hammock?! 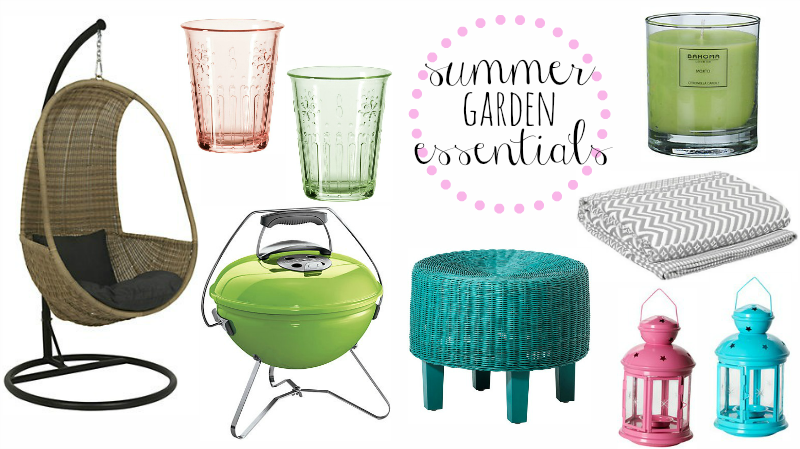 What are your garden essentials? I love the hanging pod chair! Fingers crossed for some sunshine soon! Hanging chair - absolute BEAUTY. lovely post. I seriously cannot wait for BBQ season to be here! When we get our own place (hopefully with a garden too!) I would love a hammock!